Some of the most common work injuries are musculoskeletal injuries, which involve damage to bones, tendons, ligaments, and muscles. Flail chest is a life-threatening subset of severe blunt injuries to the chest and thorax. It is the paradoxical movement of a detached segment of the chest wall that occurs when three or more ribs are fractured across the anterior and posterior of each rib. Paradoxical chest movement entails the normal chest movements becoming reversed, and it is a sign that a patient cannot move air properly. There are several different variations of flail chest, depending on which segments have suffered damage. If you suffer from flail chest on the job, you should retain an experienced Boston workers' compensation lawyer at Pulgini & Norton. 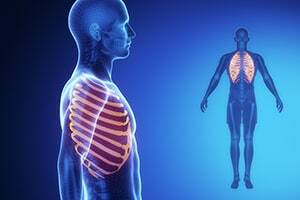 Generally, flail chest develops because a great force has been diffused over a broad area, such as the thorax. Multiple ribs are fractured in a flail chest, with at least two fractures per rib so that there is a free segment. When the ribs are already weak, such as because of old age or osteoporosis, less force is needed to create flail chest. Standard therapy includes frequent chest therapy, pain control, aggressive pulmonary hygiene, and positive pressure therapy. There has been some evidence that surgical treatment is preferable to nonsurgical treatments to reduce chest deformity, the length of an ICU stay, a tracheostomy, and the duration of mechanical ventilation. A flail chest diagnosis can only be confirmed with an x-ray, but sometimes fractures are not easily identified in the ribs, and physicians must also examine surrounding organs. Most significant symptoms of flail chest are observed in a physical exam. A doctor may note bruises, discoloration, markings from a seat belt if a car accident caused the flail chest, difficulty breathing, and chest pain. However, the symptom that points most to flail chest is paradoxical movement. Flail chest is usually connected to a blunt trauma, such as a major fall. It is important to retain legal counsel when filing a workers' compensation claim that seems likely to be disputed by an insurer. The benefits that you may receive include medical benefits as well as disability and loss of function benefits. If a spouse or parent dies from flail chest, you may be able to recover survivor benefits and funeral expenses. Medical benefits encompass medical care, prescriptions, and medical travel mileage. In Massachusetts, your employer may require that you see a doctor within its preferred provider arrangement for your first scheduled visit, but subsequently you may select your own provider. The employer's insurer may also send you to see its doctor to examine your disability. You should give the insurance claim number to your doctor so that they can bill the insurer directly and obtain preapproval to treat the flail chest. Flail chest is a severe condition. If you suffer a blunt trauma to the chest, it is important to get it checked out by a doctor right away. At Pulgini & Norton, our Boston attorneys can advise you on claims arising out of flail chest as well as many other medical conditions. We also handle claims in New Bedford, Andover, and Lowell, among other Massachusetts cities. For a consultation with a workplace accident lawyer, contact us online or call us at 781-843-2200.